YOUR RESERVATION IS NOT COMPLETE UNTIL RECEIVED BY OUR OFFICE. THE FOLLOWING TERMS AND CONDITIONS IS AN ATTACHMENT TO YOUR RESERVATION AND MUST BE COMPLETED AND RECEIVED AT OUR OFFICE. THIS IS A LEGAL DOCUMENT GOVERNED BY THE STATE OF HAWAII LAWS. IT IS APPLICABLE TO ANY CONDO MANAGED BY STARK SERVICES INC. DBA I GO MAUI VACATION RENTALS & REALTY. Reservations are secured ONLY by both receipt of deposit and completed signed Guest Agreement. Rates are subject to change without notice until deposit/agreement are both received. Reservation Agreement required pages must be received within 24 hrs of deposit invoicing. Any deposit not received within 24 hrs of credit card invoicing or 7 days for check payment sent by mail may result in cancelation of reservation at Management's sole discretion. Balance's not received prior to or by the 45 or 60-day due date (whichever applies) may result in cancelation of reservation at Management's sole discretion. Deposit required to reserve dates. The remaining balance is due 60 days prior to arrival. 60 DAYS FOR 28 DAY RESERVATIONS OR MORE, 28 DAY STAY OR LONGER MID-STAY CLEAN REQUIRED (at current listed cost). Christmas dates (balance) due by Oct 1. Sorry, no discounts for dates that include Christmas/New Year/Valentines or peak season. Non-payment of balance by the due date will be treated as a cancelation and the deposit will be forfeited. For credit card payments through the website, a 3.9% convenience fee for processing will be applied. For all mailed check payments, a check processing fee of $35.00 will be applied. NOTE: Our In-House Company Non-Refundable Damage Waiver is included in the rate quote: $69 nonrefundable Damage Waiver Fee is required for all reservations. In addition to the $69 fee, Manager may also require a valid Visa, Master Card or Discover Card number to be held on file as security to cover any damages or excessive cleaning not covered by our policy. The Damage Waiver Fee is a Nonrefundable Fee that relieves Guests of the cost for unintentional and accidental damage to the Rental Property and its contents, not to exceed the amount of coverage (up to $500.00 of unintentional damage). The Damage Waiver Fee does not cover intentional damage, theft, unauthorized entry into the owner’s supply closet, unauthorized pets, extensive cleaning required at check-out, smoking, exceeding occupancy limits or parking limits, and any other charges/policies in Manager’s Rental Policies and Rental Agreement including any fines imposed on Manager by the City, County, State or Home Owner Association as the result of violation of any law, ordinance, rule or regulation or any fines or costs levied against Guest or visitors of Guest (Excess Damage Costs). Guest will be notified of any Excess Damage Costs in writing. Any Excess Damage Costs will also be charged immediately to the Guest’s credit card. Guest, by signing below, assumes full responsibility for any items found to be missing and any damage due to misuse, negligence or action on Guest’s or Guest’s visitors part, except in the case of normal wear-and-tear reported to Manager within 48 hours of Check-in. The Damage Waiver is required, administered, and funded solely by Stark Services Inc. dba I Go Maui Vacation Rentals & Realty and we are solely authorized to determine the nature, extent, and expense associated with any damage. Cancellation prior to 60 days of arrival: Full refund less a $125.00 non-refundable cancellation fee. Cancellations 60 days or less of arrival and 60 days for a 28-night reservation or more: there is NO refund. Christmas/New Year’s cancellation must be made prior to Oct 1st. Trip cancelation insurance is recommended. Please empty trash daily to keep critters away. Our tropical climate invites unwanted pests even if the building has recently been treated, please cover containers and store perishables in the refrigerator. Guest(s) must notify immediately of any fire, water damage or other damage to the property. Guest(s) shall be liable for all acts of the family, invitees, employees, and any persons otherwise on the property during the rental period. 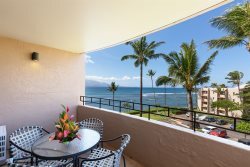 Guest(s) agrees to abide by all House Rules of the Property and of the Owner and shall not violate any law or ordinance of the State of Hawaii. Guest(s) agree to maintain a peaceful occupancy and not to disturb others and their enjoyment of the facilities. Guest(s) agrees to keep the premises in a clean and sanitary condition, to exercise care regarding all furnishings and household items and to make NO improvements or alterations. Guest(s) agrees to cook only in designated areas. Guest(s) may not sublet or assign this agreement or reservation/booking. Guest(s) shall not bring any pets, nor allow any pets on the property by any person(s) affiliated with guest(s). Guest(s) accepts full responsibility associated with the occupancy of this property and agrees to hold Stark Services Inc. and Owner harmless for any and all accidents, injuries, or death. Guest(s) shall be responsible to return all keys and inventory upon departure. A lost key charge is $25.00. Guest(s) acknowledge that there is a charge of ($35.00) for any kind of lock-out where someone from our organization will have to come and let guest(s) back into the unit. Guest(s) are to lock the unit when leaving for the day. Do not leave air conditioner running when you are not in the unit. Electricity is expensive here on Maui, and it only takes a short time to cool the unit upon your return. Suggestion: open the windows and sliders when in the unit and experience our beautiful trade winds. Occupancy of the Property Regardless of the published maximum number of persons a property can accommodate, the number of guests occupying the Property is strictly limited to those named on the Rental Agreement or any subsequent amendment notified in writing to The Owner. The stated and agreed occupancy figure includes all persons irrespective of age, day and overnight guests exceeding the number of stated and agreed persons will result in immediate eviction without refund or a $100 per guest per night charge at the discretion of management. TOILET PAPER, PAPER TOWEL, SOAP, DISHWASHER SOAP, DISHWASHING LIQUID AND WASTE BASKET LINER ARE PROVIDED TO GET YOU THROUGH YOUR FIRST DAY OR TWO. REPLENISHMENT OF THESE ITEMS CAN BE ACCOMPLISHED AT NEARBY SUPERMARKETS. Equipment and facilities are provided at the discretion of The Owner and whilst every attempt is made to ensure that such equipment is in working order for the duration of the rental period, should a breakdown or some other situation occur that renders non-essential element unusable, the Owner nor I Go Maui Vacation Rentals does not take responsibility for replacing or refunding The Renter for the lack of use of the equipment or facilities. The equipment and facilities referred to include (but are not exclusive to) such items as watercraft, motors, televisions, VCRs/DVDs, beach items, hot tubs, saunas, and Jacuzzis. The Renter must report any inoperative or defective equipment to Management promptly! Management will make every reasonable effort to have repairs made as soon as possible; however, there are limited service contractors in [Your Area]. While every attempt will be made to ensure that all the advertised equipment and appliances are in working order at the commencement of a rental period, no reduction of rent; rebate; or refund will be issued for a mechanical failure of air conditioning, dishwasher, washer, dryer, TV or other appliances. If a breakdown should occur to fundamental elements such as water systems, plumbing, and electrical systems, and major appliances such as stove or refrigerator, every effort will be made to repair or replace, or an appropriate refund will be made for the inconvenience caused. This does not apply to system breakdown caused by misuse, such as plumbing blockages caused by inappropriate use of sanitary facilities. Management is not liable, nor will provide a refund, for any stoppage of electrical services caused by extreme weather or other circumstances beyond his control. Similarly, there will be no refunds for inclement weather, changes in water levels, conditions at neighboring properties, or any nuisance afforded by the natural elements of the location such as flying insects or the animal population. Under no circumstances shall Stark Services Inc., dba I Go Maui Vacation Rentals & Realty (known as Management), Employees, Agents, Representative or Owner of property be responsible for any loss, damage, claim, injury or death (direct or indirect, consequential or otherwise however caused or incurred), whether incurred directly, indirectly, consequently or otherwise in law or equity as a result of rendering of services or accommodations as described or substituted and including without restricting the generality of the foregoing as a result of any delay(s) substitutions(s), rescheduling(s) or changes(s), in the provision of services through Management. If services or accommodations are substituted for any reason, including the sale of a property, Management agrees at all times to act in good faith and reserves the right to substitute accommodations with a type comparable to those contracted at the time of confirmation. Management reserves the right to rescind any agreement for accommodations. Management and owner will not be held liable under any circumstances, including substitutions, to refund any portion of booked accommodations or services, In addition you agree to defend, indemnify and hold all the releases harmless from any and all such claims and demands, including payment to them of the fees and costs incurred by them in connection therewith. The Renter represents, warrants, acknowledges, and agrees to use the Property and its facilities in accordance with The Terms and Conditions above and the Information provided and that he/she does so at his/her own risk.